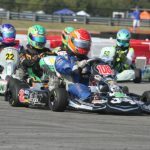 The opening day of the Chicagoland Super Grand Prix for the United States Pro Kart Series was HOT. The temperatures were in the 90s for nearly the entire day at the Autobahn Country Club in Joliet, Illinois, testing the conditioning for everyone in the paddock. Thankfully, everyone stayed hydrated throughout the day to keep from getting any heat illnesses. On track, the title chases became more defined with the seventh round of the points standings before championship Sunday is completed. On the flip side, Alex Bertagnoli (Franklin / Merlin) was untouchable in the Switch Racing Engines KA100 division. Bertagnoli swept the day, driving away to a near four-second advantage in the main event, posting his fast lap of the race on the penultimate lap. The fight was for second with Josh Hotz (Franklin / Merlin), Mike McAndrews (Fullerton) and TJ Koyen (Innovative / Exprit). Koyen was able to emerge in the position, holding on to the checkered flag ahead of Hotz and McAndrews. Jeff Lyda (Merlin) was able to finish fifth, his best finish of the season. Championship contender Brandon Jarsocrak (KSNA / Praga) struggled throughout the day, placing seventh to provisionally clinch the title for Bertagnoli. Another sweep on the day was performed by Austin Schaff in the Woltjer Racing Engines IAME Junior division. The sweep for the Franklin Motorsports / Merlin driver helped him in his championship bid, however, point leader Maks Kowalski (Franklin / Merlin) was able to bounce back from a sixth in qualifying to finish the day second. Matthew Northrup (Innovative / Exprit) posted fast lap of the race, running third. Colin Neal (MDD / Vemme) and Kyle Thome (Franklin / Merlin) completed the top-five. Brent Crews made his way back to the top of the podium in the Allison Racing Engines Mini Swift class. Championship leader Santiago Trisini (Benik) set the pace throughout the day, posting fast time in qualifying and winning the two heat races. He and Crews (Nitro Kart) battled for the top spot. Trisini was shuffled back to sixth on lap six, allowing Crews to take the top spot. He led the remainder of the race for his third victory of the season, putting him at the top of the standings. 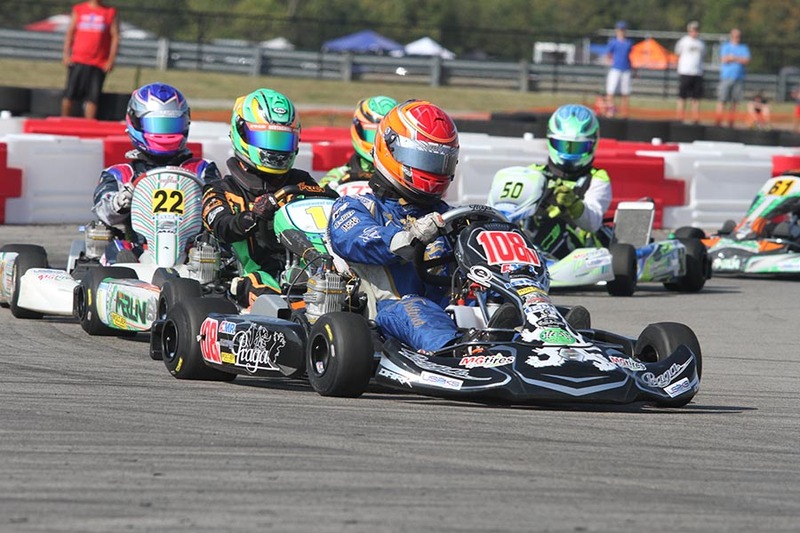 Jace Park emerged at in the second spot with the Russell Karting / Parolin driver scoring his best finish of his USPKS career. Keegan Bosch (Merlin) completed the podium with Trisini up to fourth with fast lap of the race. Nicholas Terlecki (Merlin) rounded out the top-five. The race in the Merlin Karts Yamaha Cadet category had the best racing all day long. 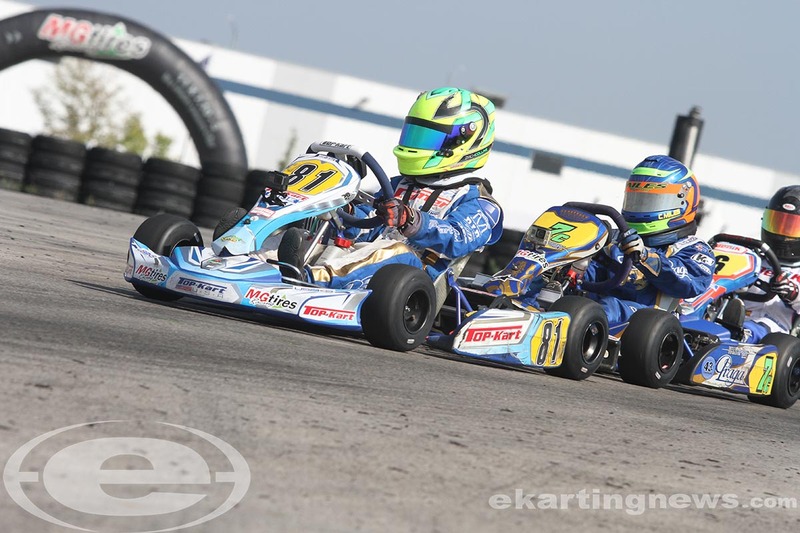 Championship leader Mateo Rubio-Luengo (Benik) set fast time in qualifying. Zach Collins (Top Kart) stole the opening heat race before Mateo secured the second. The main event saw Christian Miles (Praga) joined the two at the front of the field. Mateo led the opening five circuits till Collins took over. Miles slipped past for second and the two fought for the position. Mateo took over the position and was able to challenge Collins for the lead as they took the white flag. Through turn one, Mateo took the position and Collins sat waiting for the right moment. Into turn 11, Collins slipped inside and the two came out side by side. Mateo slowed just enough as they exited the corner with Collins holding the outside of the final turns to reach the checkered flag first, scoring his first USPKS victory. Miles was able to slip through to second, dropping Mateo to third. Alex Grapsas (Tony Kart) drove to fourth with Annie Rhule (Energy) in fifth. 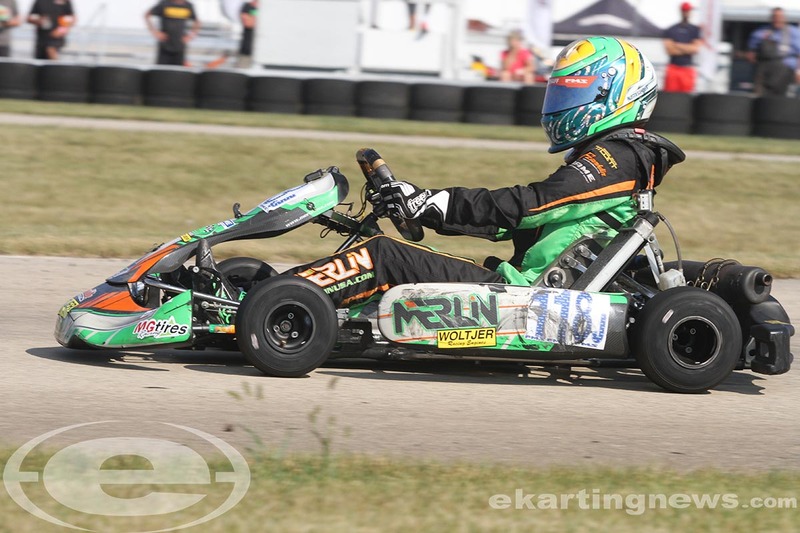 Christian Miles (Formula K) scored his first win in the Innovative Performance Micro Swift category. 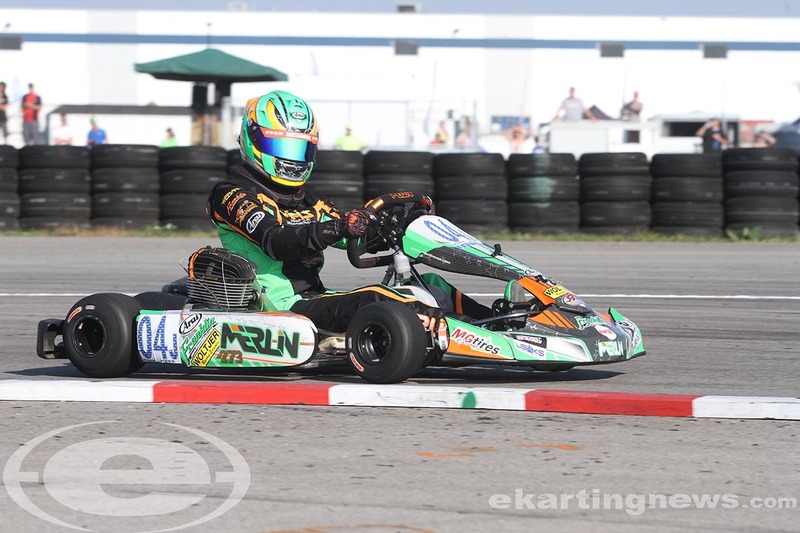 Frankie Iadevaia (Nitro Kart) scored fast time in qualifying before Miles took the win in both heat races. From there, Miles went wire-to-wire in the main event for his first victory. He held off Mateo Rubio-Luengo (Benik) by 90 thousandths of a second. Iadevaia ran fast lap of the race in third. Ben Maier (Nitro Kart) lost a chain, moving Sebastian Ng (Nitro Kart) to fourth and Jack Lynch (Haase) in fifth.